The Great Himalaya Trail is start from the eastern park of Nepal and end in the far eastern part. It is a way to enjoy the beauty of the Himalaya while helping the people who live there. You can trek the high routes and challenge yourself with some mountaineering. Spend more than 6 months on your Great Himalaya Trails (GHT) trekking. Kanchenjunga Explore 38 days - it i starting from Taplejung – Kanchenjunga South Base Camp – Salele pass – Kanchenjunga North Base camp – Lumba Sumba Pass – End trek in Tumlingtar. Makalu Everest Explore 30 days - starting from Tumlingtar – Makalu Base Camp – Sherpini coll – Amphulaptse Pass – Kongmola Pass – Chola Pass – Renjola Pass – end in Lukla. Rowling Langtang Explore 32 days - Starting from Lukla – Tashilapsha Pass- Tilman Pass – Ending in Shyabru Besi. Manaslu and Annapurna Mustang Explore 34 days - Starting from Shyabru Besi – Ganesh Himal – Larky Pass – Thorong La Pass – end in Jomsom. Upper Dolpa Explore 26 days - Starting from Juphal – Upper Dolpa – ending in Jomsom, Pokhara. Rara Mugu Explore 38 days - Starting from Juphal Upper Dolpa – Phoksundo Lake - Rara Lake – Mugu valley - Humla end in Simikot. Start from Taplejung – Kanchenjunga South Base Camp – Salele pass – Kanchenjunga North Base camp – Lumba Sumba Pass – End in Tumlingtar. Day 01: Kathmandu to Bhadrapur and drive to Illam, overnight in Ilam tea gardern at hotel. Day 02: Ilam to Shukhetar 2420m, 5 hours drive, overnight at Hotel. Day 03: Sukhetar to Lalikharka 2265m, 5/7 hours trekking, overnight at hotel. Day 04: Lalikharka to Tellok 1500m, 5/6 hours trekking, overngiht at tea house. Day 05: Tellok to Yamphudin 2080m, 6 hours trekking, overnight at tea house. Day 06: Yamphudin to Torong 2995m, 6 hours trekking, overnight at tea house. Day 07: Torong to Ramche 4580m, 5 hours trekking, overnight at tea house. Day 08: Ramche to Oktang 4730m Kanckenjunga south base camp and return to Ramche, overngiht at tea house. Day 09: Ramche to Tseram 3879m, 6 hours, overnight at tea house. Day 10: Tseram to Sele La pass then Sele La base camp, 7-10 hours trekking, overngiht at tea house. Day 11: Sele La base camp to Gunsa 4-6 hours trekking, overnight at tea house. Day 12: Rest day in Gunsa. Day 13: Ghunsa to Khambachen 4095 m, 5 hours trekking, overnight tea house. Day 14: Khambachen to Lhonak 4785 m, 4.30 hours trekking, overngiht tea house. Day 15: Lhonak to Pangpema (Kanchenjunga Base camp) 5100m and return to Lhonak, overnight tea house. Day 16: Lhonak to Khambachen, 3 hours trekking, overnight tea house. Day 17: Khambachen to Ghunsa, 4 hours trekking, overnight tea house. Day 18: Ghunsa to Nangola pass base camp 4776, 5-6 hours trekking, overnight at camp. Day 19: Nangola pass base camp to Nangola pass 7880m and trek to Dharmasala 4230, 6-9 hours, overnight at Camp. Day 20: Dharmasala to Yangma Khola Base camp 3430m, 4-6 hours trekking, overnight Camp. Day 21: Yangma Khola Base Camp to Olangchun Gola 3191m, overnight Camp. Day 22: Olangchung Gola to Langmale 3893m, overnight at Camp. Day 23: Langmale to Pass Camp 4747m, 5/6 hours trekking, overnight at Camp. Day 24: Pass Camp to Lumba Shamba Pass 5159m, and trek to Chaurikharka 4594m, 8-10 hours, overnight Camp. Day 25: Chaurikharka to Thudam 3500m, 5 hours trekking, overnight at Camp. Day 26: Thudam to Thudam Kharka 2700m, 5/6 hours, overnight Camp. Day 27: Thudam Kharka to Chyamthang 2229m, 5/6 hours trekking, overnight at Camp. Day 28: Chyamthang to Hongon 2323m, 5/6 hours trekking, overnight camp. Day 29: Hongon to Bakim Kharka 3020m, 5/6 hours trekking, overnight Camp. Day 30: Bakim Kharka to Molun Pokhara 3954m, 5 hours trekking, overnight at Camp. Day 31: Molun Pokhara to Saldim Khola Camp, 2980m, 4/5 hours trekking, overnight at camp. Day 32: Saldim Khola Camp to Cave Camp 1 3115m, 5/6 hours, overnight at camp. Day 33: Cave Camp 1 to Cave Camp 2, 5/6 hours trekking, overnight Camp. Day 34: Cave Camp to Yangri Kharka 3557m, 5/6 hours, overnight Camp. Day 35: Yangri Kharka to Kauma Danda 3520m, overnight camp. Day 36: Kauma Danda to Num 1560m, 6/7 hours, overnight Camp. Day 37: Num to Tumlingtar by Jeep 5/7 hours drives, overnight hotel. Day 38: Tumlingtar to Kathmandu by flight 40 minutes, overnight at hotel at Kathmandu. 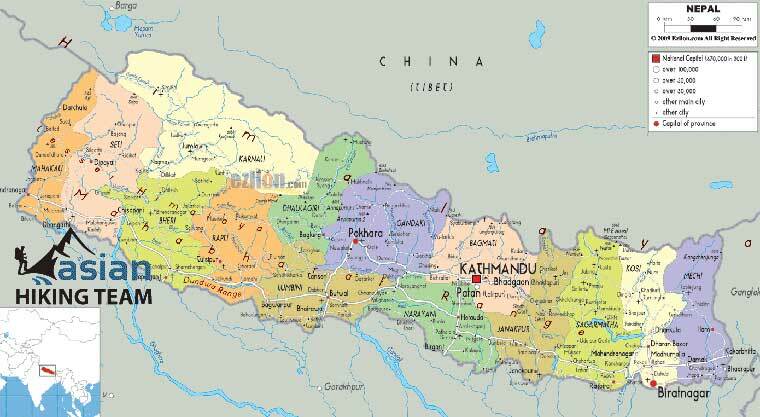 Tumlingtar – Makalu Base Camp – Sherpini coll – Amphulaptse Pass – Kongmola Pass – Chola Pass – Renjola Pass – end in Lukla. Day 01: Kathmandu to Tumlingtar 510m, 40 minutes by flight, overnight at hotel. Day 02: Tumlingtar to Num (1500m) by Jeep 5 hours drive, overnight tented Camp. Day 03: Num to Seduwa (1540m), overnight tented Camp. Day 04: Seduwa to Tashigaon (2070m), overnight tented Camp. Day 05: Tashigaon to Khongma (3560m), oovernight tented Camp..
Day 06: Khongma to Mumbuk (3550m), overnight tented Camp. Day 07: Mumbuk to Nghe Kharka (3750m), overnight tented Camp. Day 08: Nghe Kharka to Shersong (4610m), overnight tented Camp. Day 09: Rest day for acclimatization, overngiht tented camp. Day 10: Shersong to Makalu Base Camp (5050m), overnight tented Camp. Day 11: Makalu Base Camp to Hillary Base Camp, overnight tented Camp. Day 12: Hillary Base Camp to High Camp (5240m), overnight tented Camp. Day 13: Rest day for acclimatization, overnight tented Camp. Day 14: High Camp to Sherpani Col Pass (6146m) to Baruntse Base Camp (5700 m), overnight tented Camp. Day 15: Baruntse Base Camp to West Col (6143m), overnight tented Camp. Day 16: West Col to Panch Pokhari (4800m), overnight tented Camp. Day 17: Amphu Laptse Base Camp (5000m), overnight tented Camp. Day 18: Cross Amphu Laptse pass (5845m) to Juphu Kharka (4800m), overnight tented Camp. Day 19: Juphu Kharka to Chhukung (4730m), overnight at Tea House Lodge. Day 20: Chhukum to Kongmala pass (5535m) and trek to Lobuche (4900m), 9 hours, Overnight Lodge. Day 21: Trek to Gorep-shep 3 hours, after Lunch - EBC (5370m) 2/3 hrs and back to Gorep-shep (5170 meters) hours Overnight Lodge. Day 22: Early morning climb to Kalapattar (5545m) 2/3 hours after breakfast to Zongla (4830m), 4 hours Overnight Lodge. Day 23: Trek climbs to Cho-la Pass (5330m) continues to Thangna (4700m), 8 hours (up and down). Day 24: Trek to Gokyo (4790m), 3 hours, Overnight Lodge. Day 25: Climb Gokyo Ri returen to Gokyo, Overnight Lodge. Day 26: Climb to Renjola Pass (5340m) and down to Marulung (4210m), 8 hours, Overnight Lodge. Day 27: Trek to Thame (3820m), 4 hours, Overnight Lodge. Day 28: Trek to Namache Bazar (3440m), 3 hours, Overnight Lodge/hotel. Day 29: Trek all the way back to Lukla (2840m), 6/7 hours, Overnight Lodge/hotel. Day 30: Fly out from Lukla to Kathmandu - shopping and relax rest of the time. Start from Lukla – Tashilapsha Pass- Tilman Pass – Ending in Shyabru Besi. Day 01: Kathmandu to Lukla 35 minutes flight, 3.30 hours trek to Phakding 2640m, overnight hotel. Day 02: Phakding trekking to Namche Bazar 3540m, 5 hours, overnight hotel. Day 03: Rest day in Namche Bazar, explore the valley, overnight at hotel. Day 04: Namche trek to Thame, 3820m, 3 hours trekking, overnight Guest house. Day 05: Thame trek to Pachherpa Base Camp 4780m, 5/6 hours trekking, overnight Camp. Day 06: Rest day for Acclimitization, overnight camp. Day 07: Pachherpa Base Camp to Tashilapcha Pass 5755m and trek to Glacier Camp 4735m, 9-12 hours, overnight Tented Camp. Day 08: Glacier Camp trek to Chho-Rolpa Lake side Camp, 4580m, overnight at camp. Day 09: Chho-Rolpa Camp to Na 4143m, 5-6 hours trekking, overnight Camp. Day 10: Na trek to Beding 3640m, 5/6 hours trekking, overnight camp. Day 11: Bedding trek to Dokhang 2791m, 4/5 hours, overnight camp. Day 12: Dokhang trek to SimiGau 2060, 4/5 hours, overnight Camp. Day 13: SimiGau trek to Orangdanda 2029m, 5 hours, overnight at camp. Day 14: Orangdanda to Bigu Gomba 2516m, 5/7 hours, overnight Camp. Day 15: Bigu Gomba trek to Sano Jyandan, 5/6 hours, overnight camp. Day 16: Sano Jyandan to Last resort/Borderlands (1170 m) - Listi (2260 m) 5/7 hours, overnight camp. Day 17: Listi trek to Shotang Kharka, 3379m 7 hours, overnight camp. Day 18: Shotang Kharka trek to Chogomogor Kharka 3925m, 5-6 hours, overnight camp. Day 19: Chogomogor Kharka trek to Kyansin 2520m, 5 hours, overnight camp. Day 20: Kyansin trek to Tembathang 2160m, 5 hours, overnight camp. Day 21: Tembathang trek to Chedupa Kharka 2513m, 7 hours, overnight camp. Day 22: Chedupa Kharka trek to Nemagchukpa kharka 3578m 5 hours, overnight camp. Day 23: Nemagchukpa kharka trek to Panch Pokhari 4074m, 5 hours, overnight camp. Day 23: Panch Pokhari Rest day, overngiht camp. Day 24: Panch Pokhari trek to Intermediary Camp 4273m, 4 hours, overnight camp. Day 25: Intermediary Camp trek to Tin Pokhari 4255m, 4 hours, overnight camp. Day 26: Tin Pokhari to High South Camp, 4867m, 5 hours, overnight camp. Day 27: High South Camp to High North Camp 4720m, via Tilman pass 5308m 8 hours, overnight camp. Day 28: High North Camp to Kyanjin Gomba, 3830m 7 hours, overnight camp/tea house. Day 29: Rest day ib Kyanjin Gomba, overngiht Camp/ tea house. Day 31: Lama Hotel to Syabru Besi (1503m) 6 hours, overnight at hotel. Day 32: Syabru Besi drive to Kathmandu by bus (78 hours), overnight at hotel. Starting from Shyabru Besi – Ganesh Hill – Larky Pass – Thorong La Pass – Upper mustang - end in Jomsom. Day 01: Kathmandu drive to Shyabru Besi 1503, 6/7 hours, overnight at guest house. Day 02: Shyabru Besi drive to Chawatar 1 hour and trek to Gatlang 2238m, 5/6 hours hike, overnight tented camp. Day 03: Gatlang to Parvati Kunda - Yuri Kharka to Somdang 3271m 6/7 hours, overnight tented camp. Day 04: Somdang to Pangsang Pass 3842m, 4 hours, overnight tented camp. Day 05: Pangsang Pass to Tipling 1875m continues to Shertung Village 1920m, 5/6 hours, overnight tented camp. Day 07: Serthung village to Laba 2850m, overnight tented camp. Day 08: Laba to Mongeythanti 2950m, overnight tented camp. Day 09: Mongeythanti- Yarsa/Kasigau 1877m, overnight tented camp. Day 10: Yarsa/Kasigau to Tatopani 990m, 4/5 hours, overnight tea house/ guest house. Day 12: Jagat to Deng (1860m), 5-6 hours, overnight Lodge /Tea house. Day 13: Deng to Namrung (2630m), 5-6 hours 2300m, overnight Lodge /Tea house. Day 14: Namrung to Lho (3180m), 4-6 hours, overnight Lodge /Tea house. Day 15: Lho to Samagaou (3360m), 4-5 hours, overnight Lodge /Tea house. Day 16: Acclimatization rest day in Samagaou, overnight Lodge /Tea house. Day 17: Trek from Samagaon to Samdo (3690m), 4-5 hours, takes about four hours, overnight Lodge /Tea house. Day 18: Trek from Samdo to Larkya La Phedi (4460m) 4-5 hours, overnight Lodge /Tea house. Day 19: Trek from Larkya La Phedi to Larkya La (Pass) (5135m.) to Bimthang (3590m), 8-10 hours, overnight Lodge /Tea house. Day 20: Bhimtang to Tilije 2360m, overnight Lodge /Tea house. Day 21: Tilije to Tal (1700m), 5-6 hours, overnight Lodge /Tea house. Day 22: Trek to Dharapani 1943m 5.30 hours, overnight Guest house/Lodge. Day 23: Trek to Chame 2713m 5 hours, overnight Guest house/Lodge. Day 24: Trek to Pisang 3115m 4 hours, overnight Guest house/Lodge. Day 25: Trek to Manang 3450m 4.30 hours, overnight Guest house/Lodge. Day 26: The rest for Acclimatization. Day 27: Trek to Yak Kharka 4200m 4 hours, overnight Guest house/tea house. Day 28: Thorong Phedi/High Camp - Trek to Thorong pedi 4450 or High camp 4850m 4.30 hours, overnight tea house. Day 29: Thorong La Pass, hardest pass day above 5416m continues trek to Muktinath 3800m 6/8 hours, overnight Guesthouse/Lodge. Day 30: Trek to Jomsom or Marpha 2667m 5.30 hours, overnight Guest house/Lodge. Day 31: Flight to Pokhara, overnight in Pokhara at hotel. Day 32: Drive to Kathmandu 6 hours by tourist bus, overnight Hotel. Starting from Juphal to hearding to Upper Dolpa and end your trek in Jomsom. Day 01: Kathmandu to fly Nepalgunj 165m, overnight hotel. Day 02: Nepalgunj to fly Juphal 2490m, trek to good camp before Suligad 2280m, overnight hotel. Day 03: Trek to Chepka 2675m, overnight tented Camp. Day 04: Trek to Amchi clinic 3100m near Sumdowa, overnight tented Camp. Day 05: Trek to Temche 3995m, overnight tented Camp. Day 06: Trek to Dharmasal 444om, overnight tented Camp. Day 07: Rest day in Dharmasala, overnight tented Camp. Day 08: Trek to Darsumana or Dhorban through the high pass Jyanta La 5220, overnight tented Camp. Day 09: Trek to Cha, / Rapa Gomba, overnight tented Camp. Day 10: Trek to Sagu or Dechen Laparan Gomba, overnight tented Camp. Day 11: Trek to Saldang 3770m, overnight tented Camp. Day 12: Rest day in Saldang, overnight at camp. Day 13: Trek Komang (Khoma) 4060m, overnight tented Camp. Day 14: Trek to Mendo 3900m, overnight tented Camp. Day 15: Trek to Tinje 4110m, overnight tented Camp. Day 16: Trek to Rapka 4535m, overnight tented Camp. Day 17: Trek to Mola La high camp, overnight tented Camp. Day 18: Trek to Chharka 4110m via over Chharka La/Mola La 5030m, overnight tented Camp. Day 19: Trek to river Junctions camp, overnight tented Camp. Day 20: Trek to High Camp 5000m, overnight tented Camp. Day 21: Trek to Sangta Ghok via 2x passes (Niwa la 5120m, Jungben La 5550m), overnight tented Camp. Day 22: Trek to Sangta 3710m, overnight tented Camp. Day 23: Trek to Phalyak 3175m via the Bhima Lojun La 4460m, overnight tented Camp. Day 25: Fly Jomsom to Pokhara, relax and rest, overnight hotel. Day 26: Pokhara to Kathmandu by Tourist bus, 6 hours, 200km, and overnight at hotel. Starting from Juphal part of Upper Dolpa – Phoksundo Lake - Rara Lake – Mugu valley - Humla end in Hilsa Simikot . Day 04: Trek to Amchi clinic ~3100m near Sumdowa, overnight tented Camp. Day 05: Trek to Phoksundo Lake 3725m, overnight tented Camp. Day 06: Phoksundo Lake 3725m, overnight tented Camp. Day 07: Trek to Forest Camp 3725m via 4000m passes, overnight tented Camp. Day 08: Trek to Two Rivers Camp 3900m, overnight tented Camp. Day 09: Trek to High Camp 4800m, overnight tented Camp. We leave the standard trail to take our delightful, unique route around Crystal Mountain. Day 10: Trek to Shey Gompa 4375m via Shyurik La 5150m, overnight tented Camp. We cross the most scenic of passes. Day 11: Shey Gompa (Shelri Sumdo) 4375m, overnight tented Camp. Day 12: Trek to Tata 3920m or Shyamling Gompa, overnight tented Camp. This is a rarely trekked, logistically challenging route, and optional. You can also trek the standard route with our horse team and have more time around Saldang. Day 13: Trek to Bhijer 3850m, overnight tented Camp. Day 14: Trek to Pho 4087m, overnight at camp. Day 15: Trek to Pung Kharka 4650m through Nyingma Gyanzen La 5563m pass, overnight at camp. Day 16: Trek to Chyndi Khola 4830m, through the Yala La pass 5414m, overnight at camp. Day 17: Trek to Takla Khola 3785m, overnight at camp. Day 18: Trek to Thajuchaur 4050m, overnight at camp. Day 19: Trek to Tiyar 2418m, overnight at camp. Day 20 : Trek to Maha 1950m, overnight at camp. Day 21: Trek to Ghamgadhi 1800m, overnight at camp. Day 22: Ecplore Rara Lake, overnight at camp. Day 23: Trek to Bam 2700m, overnight at camp. Day 24: Trek to Ghoralnu, 2550m, overnight at camp. Day 25: Trek to Apsi Lekha 3195m, overnight at camp. Day 26: Trek to Punkha Khola 2386m, overnight at camp. Day 27: Trek to River Camp 2100m, overnight at camp. Day 28: Trek to Simikot 1900m, Overningt Hotel. Day 29: Trek to Kermi2860m, overnight at camp. Day 30: Trek to Taplung 3060m, overnight at camp. Day 31: Trekt to Tumkot 3073, overnight at camp. Day 32: Trek to Yari 3663m, overnight at camp. Day 33: Trek to Hilsa 3647m, overnight at camp. Day 34: Trek all the return same way to Tumkot, overnight at camp. Day 36: Trek all the return same way to Kemi, overnight at camp. Day 37: Trek all the way return to Simikot, overnight at hotel. Day 38: Flight to Nepalgunj and continues fly to Kathmandu, overnight at hotel. Accommodation during the trekking as best available Tea house / Hotel or Tented Camping. Camping Equipment, foods and necessary camp staffs. All special permits and documents as itinerary.